Last July, I happily took on a new role as Curator of the Theodore Roosevelt Collection at Harvard. Our collection is a major resource for the study of Theodore Roosevelt and the Progressive Era. Containing books, manuscripts, thousands of photographs, political cartoons, scrapbooks, political memorabilia, ephemera, and countless other items, the collection rewards those willing to dig into its vast depths looking for information. After a year working with the collection, I still feel as if I’ve only skimmed the surface. Luckily, I receive daily opportunities to explore the collection, in the form of reference requests from researchers located all over the world. Each question presents a little mystery to be solved, using the materials in the collection to offer clues. The TR-related parts of my day involve answering questions from patrons here at the library, by email, and over the phone; planning exhibitions; liaising with my colleagues in other departments to help organize the cataloging and use of the collection; and helping to make resources in the collection easier to find and access. 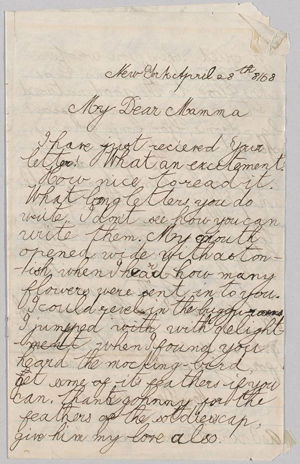 TR to Martha Bulloch Roosevelt, Theodore Roosevelt Sr., and Corinne Roosevelt, April 28, 1868. MS Am 1454.48 (18). 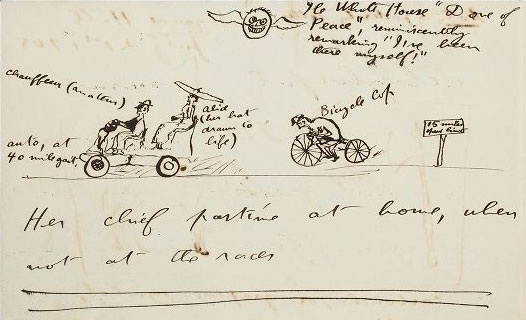 Theodore Roosevelt Collection, Houghton Library, Harvard University. TR to Alice Roosevelt Longworth, July 21, 2905. MS Am 1541.9 (69). Theodore Roosevelt Collection, Houghton Library, Harvard University. I’m happy to answer questions and assist with any TR-related research. Our collection (and Houghton Library) is open to the public year-round. More information about visiting the library can be found on our website. And feel free to contact me by email, trc AT fas.harvard.edu. Artifacts of the First Two Rough Ri...	Vive Quentin Roosevelt!